The prophecies of Daniel are relevant for anyone who wishes to understand the times we are living in, the future of this world and the great conflict between America and the Islamic nations. Jesus’ parting words to his disciples are a warning for us to study the book of Daniel. Bible experts all over the world have taught the tribulation referred to in Matthew is a seven-year period during which the Anti-Christ is present on the earth. We believe there is a time coming referred to as “the time of Jacob’s troubles” and a period of great wrath but we’re going to prove here that Jesus was not talking about a 7 year period of tribulation but the beginning of a time of Tribulation that would span over 1300 years into our own present day. Here Daniel gives the number of days between the taking away of the daily sacrifice and the abomination that maketh desolate as 1290 days. 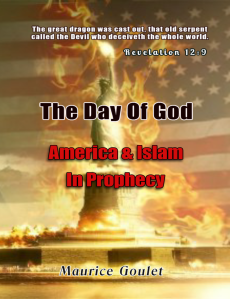 We now ask, are these prophetic days or could they be symbolic for years? Here Daniel refers to the “daily sacrifice” and since those sacrifices were only offered at the temple in Jerusalem, then temple sacrifices were probably involved. As a result, that abomination would have to be something done to God’s temple site that would defile it and make it impossible for the priests to offer sacrifices there. It was true in Daniels time and it is true today. God has not changed where sacrifices should be offered anywhere in the Bible. Which abolition of sacrifices is the Lord referring to in this 1290-day prophecy? Nebuchadnezzar ascended the throne of Babylon in 606-605BC. Twenty-three years later is 583BC. This final captivity of 583BC is a scripturally supportable time for the sacrifices to have been abolished. Babylonians took the nobles, artisans and priests captive; they left only the poorest people in the land. There were no purified priests left in the land who could offer sacrifices. What a devastating experience this must have been for God’s people in captivity. Though he was hundreds of miles from Jerusalem, Daniel knew all about these new hostages. Another group of Jewish captives being brought back to Babylon by Nebuzaradan, captain of the king’s guard, could not have escaped Daniels notice. Daniel could understand that verse by applying the unit of measure of a day equals a year. He now understood the vision. He remembered when the evening and morning sacrifices were abolished. He looked from that time forward 1290 Hebrew years into the future. He knew that an unbelievable abomination was going to trespass on the temple mount. It would be an atrocity that would make it desolate. The abomination to come would defile the site and prevent all future sacrifices. What could that terrible thing be? Daniel could not know but we can because 1290 Hebrew years since the sacrifices were abolished have already passed. They were over in 688AD. So what happened in 688AD? From 685 to 705AD, the Moslem Kalifah built a memorial to Mohamed, the Dome of the Rock, on God’s temple mount. The Dome of the Rock is the Abomination of Desolation. That is not just coincidence or suppositional theology. The day equals a year interpretation fits the words of Daniel exactly and it fits known history to the year. The construction date of the Dome of the Rock is a plain historic fact that you can prove for yourself. Look it up on Wikipedia. For the first time in Scripture, we run into the Moslems. Islam is responsible for the construction of the Abomination that maketh Desolate. The temple mount of God was made spiritually desolate over 1300 years ago and it remains so today. This is why there is such an interest among conservative Jews about tearing it down. When you apply the formula that a Hebrew year is equal to 359.78 of our days you will see how accurate God’s word is. 1290 Hebrew years equals 1271 of our years. 583BC to 688AD equals 1271. How is it the bible experts have missed this? They missed it by ignoring the next verse. Why is it people always ignore the next verse? Charles Martel defeated the Muslims in October of 732 in the Battle of Tours and with this victory he changed the course of history. Precisely 100 years after the death of the Prophet Mohammed in 632, his Arab followers, after having fought across thousands of miles and conquered lands from Arabia to Spain, found themselves in Gaul, the territory that would become modern-day France, facing a hitherto little-known people, the Christian Franks. There, on October 10, in the year 732, exactly 45 Hebrew years after the Abomination of Desolation, one of history’s most decisive battles took place, demarcating the extent of Islam’s western conquests and ensuring the survival of the West. The times of the gentiles are about to be fulfilled and a great delusion has blinded those who have not received the love of the truth. This article is an excerpt from The Day Of God available as a free download.